California lost treasure can be located. But you will not find a treasure with just pure luck. You will need to research the treasure. Below I have given you some brief stories about treasures hidden in California, however, they are just the beginning, and should give you a start to more research. Start with the Internet. Gather information about your treasure story by locating any books, maps, or old newspaper articles that may help you. Visit the historical society in the area you will be searching. Often times they will have documents like old newspapers and maps that may be of use. Talk with the older individuals of the area. Our senior citizens have a wealth of information regarding the area they live in. They may remember bits and pieces of the treasure story you are working with. Sometimes they will give information that could help you expand your research, and that may help you locate that treasure. Using a metal detector is a good way to locate buried treasure. 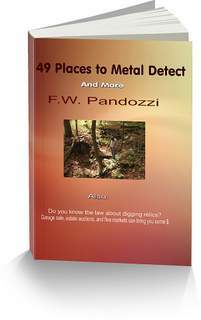 If you do not have a metal detector, and you are thinking of purchasing one, please visit my online store. The Mission of San Luis Obispo - this Mission is still standing about 75 miles northwest of Santa Barbara. In 1772 a Spanish settlement was built around the Mission. In the 1900’s when the Mission was rebuilt workers found silver bars hidden in the floors beneath the chapel. Legend has it that there is still buried treasure lying in wait, ready to be recovered. The ruins of the Mount Ophir Mint - located outside of Mariposa and dates to 1850. A large number of gold coins are supposedly buried on the property. The Ghost Town of Skiddo - located off State Rte 190 approx. 9 miles east of Emigrant Junction in Death Valley. This was a main borax-mining town that was deserted before 1900. The San Antonio de Padua Mission - located on US 101 approx twenty miles southwest of King City. This Mission was established in 1771. Treasures are believed to be buried in the area. Mattole River located south of Eureka - there have been gold and silver coins dated between 1804 and 1809 found on the beaches. A shipwreck offshore is the apparent reason for the coins. Town of Weed - located in Siskiyou Cty. A buried treasure of stolen gold coins is believed to be buried here. 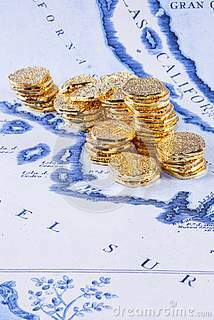 Understand the law before searching for California lost treasure. California lost treasures may be located in ghost towns.